Home Babe baby pictures breaking news extra features Pakistan picture story Special Feature A Six-Legged Baby! I like to share with you an extra ordinary news. This was reported last night in different news channels. A baby was born having six legs! These photos were released by the National Institute of Child Health (NICH) on April 16, 2012. They show a baby having six legs. The baby was born in Pakistan. As per the news, the baby lies in an Intensive Care Unit (ICU) ward at a hospital in Karachi. 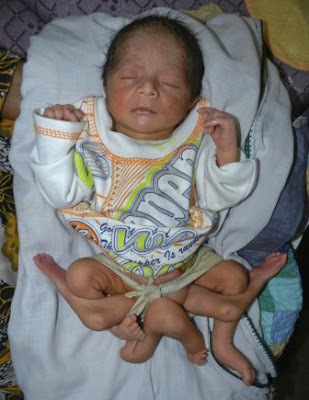 The officials said that the doctors in Pakistan are fighting to save the life of a baby boy born with six legs because of a rare genetic condition. "Si Batang Ama" At "Si Batang Bato!" Featuring the Our Lady of Grace Church! April 2012 - "Cheers for Celebrations!"